Home birthstone The Metaphysical Qualities of Your Birthstone. A birthstone is a stone that brings out the best in you. It supports your core characteristics and enhances your strengths. Your birthstone is what can support you in staying true to your zodiac when other aspects of your surroundings are pushing you down. Every zodiac sign has a specific gemstone that it has an affinity with. This gemstone becomes the birthstone for those born under that specific zodiac. 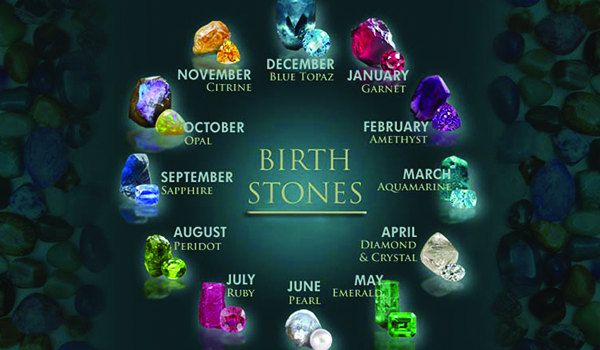 Are you curious about what your birthstone is and what its metaphysical qualities are? Let’s start! The diamond is the birthstone for those born in the zodiac of Aries. Diamond is known or purity under pressure, and its strength. For the Aries, the diamond can bring a great deal of clarity of thought. It can help the hard-headed Aries see through the fog around them, and continue on their intended path. The Taurus is naturally sensitive and selective being. The emerald has the ability to awaken the 4th chakra in the Taurus and strengthen memory and emotional stability. The Emerald has the energy of abundance and compassion, which allows the Taurus to stay on their path without diversion. Pearl is a gemstone that suits the duality of the Gemini nature. The pearl is known for being a cooling and calming gemstone. For the Gemini, who tends to face anxiety often, due to their dual nature, the pearl can bring great calm. A pearl can help the Gemini face and accept the beauty in their rawness. The cancer is all about their home and protecting it. Other than the Diamond, the Ruby is the strongest of all the birthstone. This enhances the Cancer’s protective instincts. More so, Ruby has the crystal energy of adventure, life force, procreation and protection, all of which are held dearly by the Familial Cancer. A Peridot is perfect for the mighty Leo. Leos are prone to feeling negative emotions of great magnitude. The Peridot is the birthstone that exudes a great deal of positivity. It can deter anger and anxiety. It also has the energy of abundance, manifestation and amplification. As such, the Peridot is the birthstone that can not only save the Leo from the negative impact of their nature but also enhance the sheer royalty that makes every Leo. Virgo is a sign of wisdom. The Virgin is the calm and wise one in the zodiac. However, Virgo is also a sign of great sexual energy, one that not many can satisfy. Sapphire is a birthstone to Virgo to help them stay on the path of fidelity and wisdom. Sapphire is a stone of peace, leadership and creativity. A Virgo tends to have sleep issues. Donning a Sapphire can help them alleviate those issues in the long run. Libra is the sign of balance. They are the pragmatic ones in the zodiac. The pal compliments the Libra because it stands for the energy of inner fire and intuition. One of the biggest dilemmas the Libra has to face is deciding which way to go. They hate confrontation, and as such delay decisions. The Opal gives them the gumption to take the call as per their natural intuition and act on it. Scorpio is known for their complete submission to passion. A Scorpio will do that and only that which their heart agrees with. Topaz is known for being able to balance the chakras and connecting one with their higher self. The Topaz helps the Scorpio connect with their real passion, not just its superficial manifestation, and act on the greater good. It develops self-control in the wearer, giving them the ability to think before they act! The protector of the Zodiac, Sagittarius is ruled by Jupiter. As such, they have a tendency to consider themselves the mother of the zodiac. The Turquoise can open all the chakras of the wearer, making them more self-aware. Sagittarius has a tendency to often come in their own way, the Turquoise’s capacity to open the third eye can help them see the greater joy in the adventure of life. A Capricorn is a perfectionist to a fault. They have a tendency to not leave anything to chance. The Garnet can help this zodiac by opening their base and heart Chakras. The Capricorn also has a tendency to get depressed and feel extreme anxiety, leading to self-entitlement. The Garnet can help them balance and revitalize their energy, giving them a boost of purity that can alleviate emotional disharmony to a great extent. Amethyst has the energy to bring money, power, protection, wisdom and prophecy to the wearer. As such, it is only obvious that it belongs with the water bearer of the zodiac. Aquarius is the wisdom bearer of the zodiac. They do not experience the feeling of greed and are compassionate; the amethyst helps them connect with their higher self and guardian tendencies. Aquarius can be victim to witchcraft; the amethyst can protect them from that as well. It is only obvious that the birthstone for the fish will be the Aquamarine. Pisces are the dreamers of the zodiac, the Aquamarine is the stone of courage and can help them make their dreams come true. It helps self-expression, which every Pisces is known to need help with. A Pisces has a tendency to be confused, which the Aquamarine can help dispel from their minds. So, there you go. The zodiacs and their birthstones with their metaphysical characteristics. Now you know which gemstone is right for you!